[W]hen a Tokyo city councilman in an official meeting said “Japan never invaded Korea,” her history class sent an apology to Korean President Roh Moo-hyan – an action that sparked her removal from her classroom. The class never heard from the Korean consul. But Masuda did hear from the Tokyo Board of Education. Her letter was discovered by a Yasukuni shrine support group and they complained to city officials. Masuda was told that while Mr. Koga did speak in public, it was “inappropriate” for Masuda to repeat his name in a letter that was not private, and a violation of city employee codes. Masuda is now ordered to spend her days in a small room studying public servant regulations, a serious humiliation she says. She in turn is trying to fight in court. I wonder if there is any sort of support campaign for Ms Masuda, or if there is an e-mail address where those of us who want to can send messages of support. My name is Yu-na Kim. I’m a master course student at Seoul National University in South Korea. I’m currently writing a thesis about ancient China’s public health system and national organization. My focus is on the ancient history of china, but I also have a strong interest in Korean history and culture. I have a keen interest in the life and culture of our ancesters – what they thought and how they lived. It might even be from myth or legend and my interests extend even to ancient clothing, customs and taboos. My postings on my personal weblog are mosly about Chinese and Korean history, culture and literature but I write only in Korean. This is my first time writing on an international weblog. But I’m very excited to be participating. I look forward to discussing many historical topics here. I have just finished reading a new book on Korean cinema (New Korean Cinema, New York: NYU Press, 2005, edited by Chi-Yun Shin and Julian Springer). It was a satisfactory read, most of the essays in it are good, some excellent. It has left me with some questions, though, and I am curious how other academics working on Korea think about these questions. Reading this book (and others as well), I have come across repeated statements on nationalism with which I find it hard to agree. The first one is the generally shared assumption that South Korea is an intensely nationalist country and that art (cinema) has to overcome nationalism (and nationalism alone) to become ‘real’ art. While superficially this may seem to be the case (especially from the outside), I have often found that, with the exception of the radical nationalists, nationalism is often a matter of rhetorics, not entirely perhaps, but to a significant extent at the least. Cultural studies in particular seem to take the all-pervasive influence of nationalism as a given, without problematizing what kind of nationalism is being discussed, in what context and from whom it emerges and for whom it is intended. The rhetorics of nationalism, as those of any influential ideology, must perhaps not be taken at face value, but be seen as a distinctive and for its users familiar way of communication. Dear all, one topic that might be interesting to discuss is the degree of the development of market relations, exchange economy and internal trade in early traditional Korea. I myself fell in love with this sort of things while reading the materials on the discussion on the so-called “Asiatic mode of production” in (still Marxist-Leninist) Soviet historiography of the 1960-70s. My older colleague, Prof. S.V.Volkov, was, in fact, a champion of this theory, which was also carefully backed by my dissertational adviser, M. N. Pak – also the latter chose not to irritate the mighty orthodox opponents of the “Asiatic mode” thesis and speak very carefully about “early feudalism”, with an “extremely low degree of the development of market relations”. Of course, now I understand more or less that the over-generalisations about “Asian” history as a whole smack too heavily of Orientalism to be taken seriously; China and India after 15-16th C. had the degree of the “proto-capitalist” development Europe could be envious of at that point, and some archaic “European” societies (Spartan, for example), also seemed to have highly centralized exploitation/redistribution systems. So, if we want to continue developing this thesis, we probably should speak of early statehood in a more general context, taking references to “Asian” out; we may also speak, I guess, about agrarian bureaucracies, which manage to preserve and develop to a fantastic degree of complexity the centralized redistribution mechanisms rooted in the “state exploitation” technologies of the early antiquity. But, with all these reservations and precautions duly taken, I still suppose that the earlier Marxist insights about centralized redistribution and its historical trajectory in the agrarian monarchies continue to be valid – and wonder what the others think about it. For one thing in Korea particularly, a fact Korean historical textbooks seem to studiously avoid mentioning is that Korea began minting metallic coins only in the late 10th C. (and on very small scale) – compared with Japan’s 7-8th C. coins production and China, which had coins already for almost a millenium to that point. In fact, various Chinese coins seem to have been used by the proto-Korean state already in the ancient Chosŏn time – but mostly for external exchange and/or prestige purposes. The media of the internal exchange in Unified Silla seems to have been either rice or textiles: the markets in the capital were managed by the state (kwansi) and most of the high-level artisanship in the capital was concentrated in state workshops. State was the biggest actor in these commercial transactions, which still took place – buying, for example, lots of paper for the sutra-copying at the state-run temples (we have mokkan materials on these transactions). Private external trade started to flourish when central controls weakened in the late 8th – early 9th C. – but powerful merchants like Chang Pogo were more interested in acquiring state power than in the development of the purely commercial side of their enterprises. So, shouldn’t we conclude that “early feudal” (to use M. N. Pak’s term) Korea really largely lagged behind in the terms of market economy development, compared to its neighbours – the state both controlling the existing (internal) market operations and largely substituting the market with its own production/distribution network? I am working with Oslo University (Norway) currently teaching a strange combination of undergraduate and postgraduate courses, which include East Asian religions and philosophies on one extreme (?) and something called “East Asia: Capital and Labour”, and mostly dealing with the relationship between corporate capital and unions in South Korea and Japan, and the rising current of labour militancy in China, on the other. I used to teach Korean language as well, having proudly produced around 6 graduates in 5 years. I have thought before that the University of Oslo must be the only place in the world where three teachers (me and two colleagues working part-time) teaching two students a language no business around might demand, would be tolerated and left in peace. Well, it was a naive illusion – Oslo University is following the same “party line” as elsewhere, and the teaching of Korean is going to be terminated next year, at least for the time being. My academic trajectory (?) is odd enough to doubt its seriousness. I began with Kaya studies, when I was MA student and then PhD candidate – for those sane enough not to jump into the abyss of the ancient history, I can just explain that Kaya proto-states (they stood somewhere between a well-developed chiefdom and an early state) controlled a large part of the Naktong River valley and the southern coast of what is KyOngsang Province now, until being eaten up by Silla in 562 (http://www.gayasa.net/). I wrote a PhD thesis on this, mostly using Nihon shoki (720) as my source material. I guess that is the only monograph written on Kaya in Russian – and it is likely to maintain its monopoly (?) for the time being, given the sad situation in the Russian academia. Then, I started to dabble in Korean Buddhism – after having been greatly surprised at sight of a reserve corps military uniform at one temple I frequented, and having understood how much practice might differ from theory. The last “side jump” was my love (or rather hate?) affair with Korea’s (and, by extension, China’s and Japan’s) Social Darwinism, which began around 5 years ago, and still fails to end. I am still struggling to understand in which ways and to which degree Social Darwinist consciousness contributed to the making of Korea’s nationalism in the 1880s-1900s, and what was the logic behind the Social Darwinist conversion (?) of many intellectuals who might have espoused different dreams as well – reformist Confucians, Christian converts, and some younger Buddhists. Before diving into some descriptions of the Korean mind and personality in the readings considered in this series of postings (Part I begins here), let me make a few observations. In the postings I have written so far, the various generalizations made about Koreans tend to fall under two categories: 1) unqualified claims about the inherent features of Korean people and culture 2) Generalizations about Koreans which are more explicitly placed in the context of a narrative of contingent backwardness, oppression, and a “not yet caught up” state of barbarity. A surprisingly large number of descriptions that I have discussed so far involve claims about the inherent character of the Korean people, with few or no qualifications. 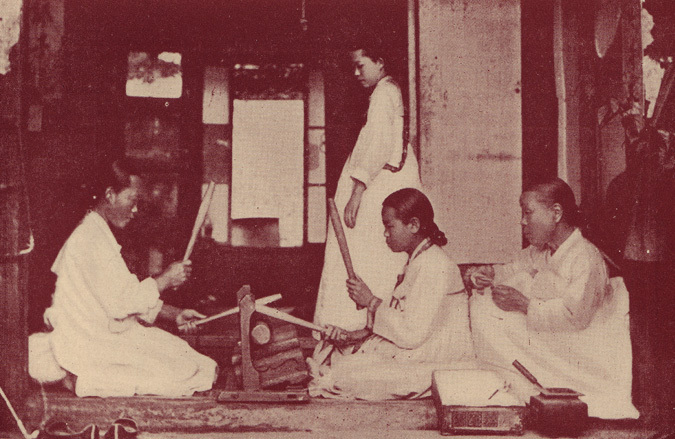 Koreans are said to have some feature by virtue of their distinctive culture, or, for lack of any explanation, as some kind of other racial or ethnically inherent characteristic. To be fair, the most derogatory and frustrating claims about Koreans are often made in passing and, except when directly justifying Japanese intervention in Korea, do not form a central argument in that segment of the narrative. Thus it may be too much to expect the writer to carefully make qualifications for every claim in such writings, especially when they have emphasized the “future potential” for the development of Koreans elsewhere. This does not mean, however, that the second category, which emphasizes that the various vices and deficiencies of the Koreans are contingent features of a barbaric and as-yet unenlightened people are any less objectionable. As more than one generation of philosophers and historians have pointed out, there are many problems with a universal progressivism which happily divides the world between barbarity and civilization. It forms the very foundations of imperialism, the justification for countless forms of state aggression, and many claim that civilization has made a mockery of itself in the great and tragic wars of our century. Let us not get distracted by such issues here, however, despite their central importance in any discussion of imperialism in Korea. For now, it will suffice to note the tension, in many of these writers, between expressions of sympathy or pity for an as-yet uncivilized or oppressed people who have not reached their “potential,” and the more dismissive and bitter claims about an essentially irredeemable Korean race. As one might expect, descriptions of Korean women in the writings by Western visitors that I have looked at tend to be completely dominated by the theme of pity. This goes both for the male writers and the two female missionary writings by Underwood and Bishop. Very rarely are women seen as having any power nor do they emerge in the writings as concrete individuals to whom the authors dedicate more than a few lines notice. I’ll mention a few of the important exceptions below.